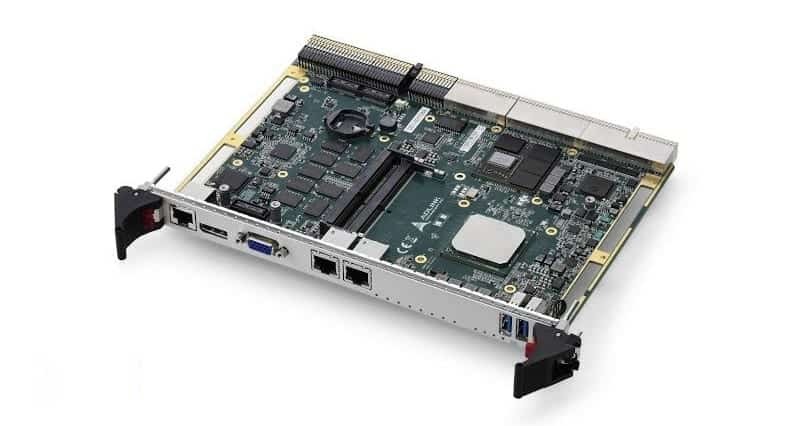 ADLINK Technology, Inc., a provider of embedded technologies, has announced the introduction of its new cPCI-6940 processor blade featuring the Intel Xeon processor D-1500 and AMD Radeon E8860 embedded GPU. The cPCI-6940 6U CompactPCI processor blade offers up to 16-core computing power and high-performance graphics in a robust design. With an extended operating temperature range of -45°C to 85°C and 16GB of DDR4 soldered memory, the cPCI-6940 is ideal for the rugged environments encountered by manned or unmanned military field vehicles and naval or aerospace carriers. Featuring the Intel Xeon processor D-1500, the latest server-grade CPU from Intel, and up to 48GB DDR4-2133 ECC memory (16GB memory down plus 32GB SODIMM), the cPCI-6940 achieves high performance for compute-intensive applications including aerospace data acquisition and remote vehicle control systems. Designed to satisfy low power, high-density requirements, the Intel Xeon processor D-1500 has a TDP of 35 to 45 watts and gives the cPCI-6940 a 1.5x performance increase over its predecessor, the cPCI-6930 (8-core Intel Xeon processor E5-2448L). Server class computing capabilities include hardware virtualization and Intel AES-NI for secure transmission in the field. Graphics on the cPCI-6940 are supported by the AMD Radeon E8860 GPU, the first embedded GPU based on the Graphics Core Next (GCN) architecture for enhanced processing power and efficiency. A 625MHz graphics engine, 2GB GDDR5 frame buffer, and PCIe Gen3 interface give the Radeon E8860 double the 3D graphics performance of its predecessor, the E6760. The E8860 GPU enables four independent displays at 4K resolution and supports DirectX 11.1, Open CL 1.2, and Open GL 4.2. Ruggedized design provides enhanced portability and security for ADLINK’s newest processor blade. In addition to an extended operating temperature range, the cPCI-6940 features soldered CPU, GPU, and memory, as well as a 3.5 Grms vibration tolerance and conduction-cooled compatibility. The Radeon E8860 GPU provides outstanding performance with a 10 percent increase over the cPCI-6350BL with competitive graphics capabilities. Increased performance-per-watt over previous ADLINK CompactPCI blades makes the cPCI-6940 an excellent choice for applications with restricted power consumption. Additional features include remote management by Intelligent Platform Management Interface (IPMI) v1.5 and Trusted Platform Module (TPM 2.0) support. The cPCI-6940 is available in single/dual-slot (4/8 HP) width form factor versions and offers flexible connectivity and storage options. Faceplate IO includes 1x RJ-45 serial port, 1x DisplayPort, 1x VGA, 2x GbE, and 2x USB 3.0 ports. Dual slot versions support dual integrated 10G SFP+ KR ports, while two additional 10GBASE-T ports can be configured through XMC expansion. Two DVI-D ports are routed to rear I/O. Expansion options include one PCIe x16 to J4 and one PCIe x4 to J5. Storage is provided by up to two 2.5” onboard SATA drives and four SATA ports routed to the backplane.